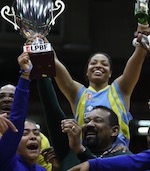 Correcaminos celebrated LPBF title. They edged Panteras in the Final in the championship game. Correcaminos forced 25 Panteras turnovers. Veronica Vega (-90) stepped up with a double-double by scoring 15 points and 16 rebounds for the winners and guard Lirieth Gonzalez (170-1) chipped in 13 points and 10 rebounds. At the losing side American guard Kiley Herold (185, college: MidAmerica Naz.) responded with 12 points and 8 rebounds and center Marisol Plato scored 13 points and 5 rebounds. Both teams had four players each who scored in double figures. Both coaches used bench players which allowed the starters a little rest for the next games.